Islamabad: The new aid package for Pakistan passed by the US Congress last month—a promise of $7.5 billion (Rs34,950 crore) for civilian needs over the next five years—has unwittingly thrust the US into the centre of the perennially uneasy relationship between Pakistan’s powerful military and its weak civilian governments. In this case, the US stepped into the middle of what politicians describe as a deteriorating relationship between the head of the army, General Ashfaq Parvez Kayani, and President Asif Ali Zardari, by insisting on greater civilian oversight of the military as a condition of the aid. Instead, on Monday, virtually on orders from the military, foreign minister Shah Mehmood Qureshi was sent to Washington to tell US officials that Pakistan would not stand for being micromanaged. Now it appears that the aid bill, rather than assisting Zardari and improving America’s relations with Pakistan, threatens to undermine the president and lay bare the troubles at the heart of the two countries’ alliance. In supporting Zardari at what appeared to be the expense of the military, the Americans hit a raw nerve, several Pakistani politicians said. Kayani has made clear that he supports democracy in Pakistan, and that the military has no intention of overturning the civilian government, Pakistani politicians said. But what appears to be his distaste for the Zardari government is now barely disguised. On Saturday, in the middle of the siege of the military headquarters, the general took a helicopter to the presidential palace to meet with the president, his foreign minister and Prime Minister Yousaf Raza Gillani. Afterward, Qureshi was sent to Washington to tell the Obama administration that Pakistan had deep reservations about America’s intentions. The military, no doubt, also has deep reservations about ceding powers it has long accumulated, and the perks that go with them, to an inexperienced government it criticizes for mismanagement of the crumbling economy. “The army is saying privately that despite everything, the army remains the one rigorous, merit-based institution in Pakistan, and if the politicians get their hands on promotions, that will be the end of it," said a member of Parliament, who declined to be named because he was not authorized to disclose military thinking. US and Pakistani officials who support the aid package voice increasing concern that critics of the Bill are manufacturing a crisis to discredit and undermine the civilian government. The stipulations in the aid Bill, they note, are no more onerous than those of past aid packages, including those on aid given during the eight-year rule of the previous government under General Pervez Musharraf. At that time, the military raised no objections. What is more, the new aid for civilian needs is in addition to the more than $1 billion a year the US already gives the Pakistani army. “This is a created crisis, by people who either haven’t read the Bill or don’t want to describe it accurately, and whose goal is either to destabilize the government or challenge some of the Pakistani military’s priorities," said Howard L. Berman, who leads the House foreign affairs committee. The spokesman for Zardari, Farhatullah Babar, has appeared on Pakistan television seeming at times a lone voice in defence of the legislation, charging that the fierce criticism of the American largess is actually intended as a direct hit at Zardari. Perhaps more important, the Bill has placed the Americans in the middle of a potential tussle between Zardari and Kayani over the future leadership of the army. The three-year tenure of Kayani, with whom US military commanders say they are enjoying an increasingly good relationship, ends in November 2010. 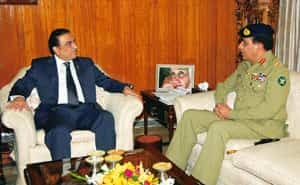 Zardari might like to appoint his own general, Pakistani politicians say, though officials in the Zardari government say the president is yet to make any decision. It is believed that Kayani would like an extension of tenure, unheard of in Pakistani military history for a general who has not served as president. But Kayani has been riding high. That 10 militants managed to raid a military intelligence building seemed only to strengthen the standing of the military in the eyes of the public and Pakistan’s boisterous and patriotic talk shows. Questions about the soundness of the security at the military nerve centre were offset by accolades for the commandos who rescued 39 hostages, some of them officers who had sat in a room with a suicide bomber for 20 hours. The army remains the country’s most revered institution. Its prickliness over American intrusions dovetails neatly with a widespread feeling of anti-Americanism here that has not changed with the Obama administration. Surprisingly to the Americans, the anger against the legislation has spread so widely that even civic leaders and lawyers who took to the streets two years ago against Musharraf offered no vocal support for the American aid. “Criticisms coming from outside affects the Pakistani ego," said Athar Minallah, a leader of the lawyers’ movement that eventually won reinstatement of the chief justice dismissed by Musharraf, Iftikhar Muhammad Chaudhry. “People ask: Why should this dictation come from the outside?" Pakistanis tend to have good memories, and view the up-and-down American record in Pakistan with deep distrust, a history that colours the current attitudes. The lawyers would seem to be a natural constituency to help generate support for the new civilian assistance. But under the Bush administration, Washington remained conspicuously silent when the lawyers took on Musharraf, and the lawyers feel little obligation to help Washington now. A common theme in the Parliament in the last few days has been to label the $1.5 billion a year as “peanuts"—the same term used by the military dictator General Muhammad Zia ul-Haq when he turned down $400 million from President Jimmy Carter. A year later, Zia won a six-year, $3.2 billion package from President Ronald Reagan. But Washington has a good memory, too, and Pakistan’s own record has its infidelities in American eyes. US officials have not forgotten about the global nuclear proliferation network once run from Pakistan, nor about the support the country has given to terrorist groups that oppose India. But when it comes to Pakistan, Washington has had a tin ear, said Maleeha Lodhi, who served as the Pakistani ambassador to Washington at the time of the terrorist attacks of 11 September.